READING, United Kingdom (AFP) - Reading Gaol broke Oscar Wilde during his two-year incarceration but 120 years later, the prison is welcoming the Irish writer back -- this time through his works, in an exhibition on isolation. It would be hard to find a better place to discuss separation, deprivation and despair than within the Victorian prison’s walls. Opened in 1844, it closed in 2013 but is now open to the public for the first time. The barbed wire on the walls and the tiny cells leave visitors in no doubt as to its past. At the height of his fame Wilde was convicted of gross indecency over his homosexuality and sentenced to two years of hard labor, and was locked up in the jail between 1895 and 1897. He was in isolation for 23 hours a day, in cell C33. “In 1895, Oscar Wilde was one of the great celebrities of his time,” said James Lingwood, co-director of exhibition organizers Artangel. “He had plays on in the West End, he lived a glittering social life. Three months later he found himself in Reading Gaol. The prison regime here at the time was absolutely brutal, it broke Wilde,” he told AFP. Wilde never recovered from his spell in Reading Gaol. Three years after he was released, he died in exile in Paris at the age of 46. “The experience in Reading broke Oscar Wilde but at the same time also made him,” said Lingwood. He also spent three months writing a 55,000-word letter to his lover Lord Alfred Douglas, in 1897. It will be read each Sunday over four and a half hours by artists including the US punk singer Patti Smith, the British actor Ralph Fiennes and the Irish novelist Colm Toibin, in the prison chapel. The main focus of the exhibition is found in the paintings, writings and works of contemporary artists displayed in the cells. Nine of them have written letters on the theme of separation from a loved one. Among them, Ai and the Northern Irish author Danny Morrison can speak with authority, having served time in prison. In other cells, visitors can find the works of McQueen, German photographer Wolfgang Tillmans or US sculptor Robert Gober. 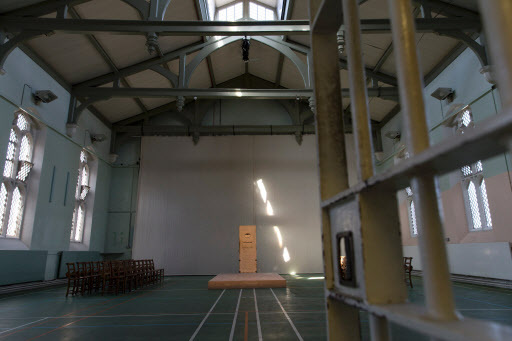 Of the artists contacted by Artangel, “almost without exception they felt drawn to the idea of making new work, installing work in Reading prison,” said Lingwood. Listed as a building of national importance, the empty jail's future remains uncertain, sitting on a prime piece of land in the commuter town’s center. In the meantime, the prison continues to radiate the sense of oppression and confinement which fits the bill of rediscovering Wilde in his darkest hour. The exhibition runs from Sep. 4 to Oct. 30.